Product and ordering information for Aluminum support jacks. Stainless steel lift mechanisms combined with anodized or epoxy powder-coated aluminum decks for economy and long life. Available in a wide range of sizes and load capacities. Exceptional stability, even in the larger sizes. 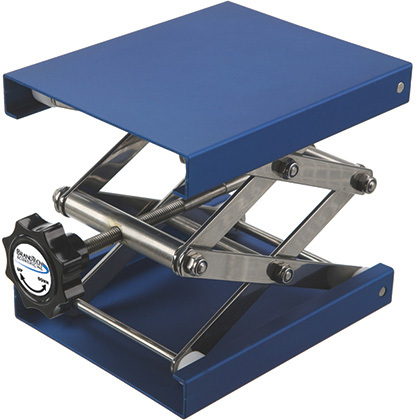 Our aluminum support jacks combine the solid construction of stainless steel lift mechanisms and POM rollers, with either anodized aluminum decks or durable epoxy powder-coated aluminum decks for economy and long life. 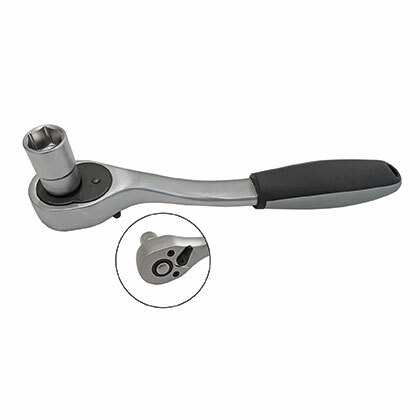 The height adjustment handwheel is made of phenolic resin. Their rugged construction also provides exceptional stability, even in the larger sizes. They are popular for use in a wide variety of environments, including fume hoods, solution-baths, and marine and industrial laboratories. A racheting handle is provided to simplify use of the larger support jacks. 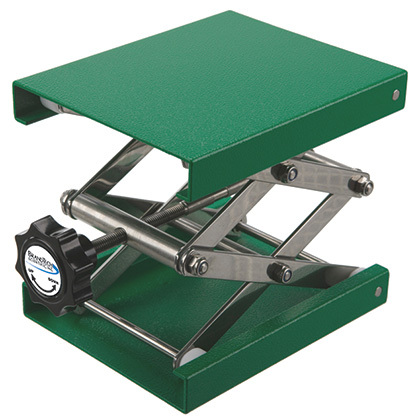 This handle simply slides onto the handwheel of the 30 x 30cm and 40 x 40cm support jacks to greatly reduce the effort required for raising and lowering the jack.